I got back from Austin Friday evening. I was looking forward to having three days to work on recipes, cooking, blogging, and knitting (in that order). After all of the holiday treats and sweets, I was also looking forward to getting back to a healthier, more vegetable-oriented diet. But the best laid plans often go wrong, and on my trip to the grocery store Saturday morning I took a different kind of trip and landed face down on the sidewalk, having scraped the hell out of my knee, the side of my right hand, and somehow (and I still don't know exactly how) right above my right eye. As has been the case in previous falls, the knee was the most painful and what I was most worried about, but it was my hand that turned out to be the most problematic. For one thing, it wouldn't stop bleeding the whole time I was at the store, and once it did stop it took forever to scab over, and then it hurt like hell for quite a while when it got wet. Not only was cooking difficult, washing up afterwards was nearly impossible. The bruise on the inside of my hand has not made it any easier. So I have cooked some, but nothing new or too strenuous. 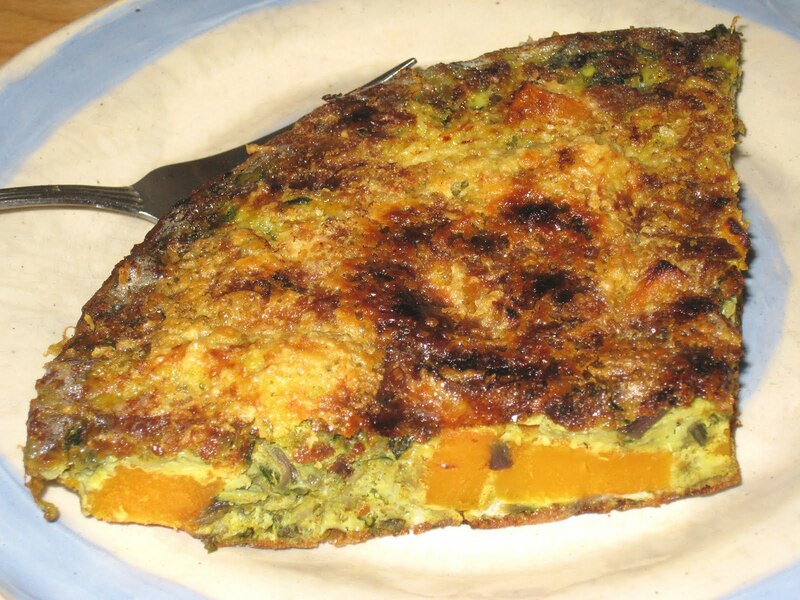 This is actually a frittata I made last year (all right, last month), but it was delicious and it isn't a cooky or candy, so I am going to go with it for my first post of the new year. I first discovered dandelion greens in one of those bagged organic pre-made salads I used to buy. I didn't know what it was, but there was something in there that had a musty, almost skunky flavor. I know that sounds really bad, but it is actually quite delicious when it is subtle, as it was in the salad mix. It wasn't until I bought a bunch of dandelion greens for the first time and tasted them that I realized that they were what had provided that wonderful umami sensation. I needed something more to fill out my frittata and I had some roasted butternut squash in the refrigerator. I had already put diced sweet potato in a previous frittata, so I knew the squash would work. And it was a beautiful combination of ingredients. I used my usual frittata technique, putting the butternut squash into the egg mixture without heating it. As you can see, the top came dangerously close to burning, but I managed to pull it out of the oven just in time. If you haven't tried your hand at one yet, you really should. Once you get the hang of it they are quite easy, and since they can be eaten at room temperature they make a great carry-along breakfast for those days when you don't have time to eat before you leave the house in the morning (and I know we all have those days).